Photo courtesy Tourism Bureau of MOTC, ROC. Taiwan’s railways offer an endless variety of experience, and the scenery lining their routes provides an infinite range of fascinating scenery. If you want to get a close look at the island’s beauties without having to suffer the problems of unfamiliar roads and the frustrations of traffic congestion, then you could do no better than to choose a railroad tour and immerse yourself in the delights of enchanting coastlines, awesome mountains, placid farmlands, and engrossing countryside. Taiwan’s total land area is only about 3,600 square kilometers; it is shaped like a tobacco leaf that is narrow at both ends. It lies off the southeastern coast of mainland Asia, across the Taiwan Straits from Mainland China — a solitary island on the western edge of the Pacific Ocean. To the north lies Japan and Okinawa, to the south is the Philippines. Many airlines fly to Taiwan, helping to make it the perfect travel destination. Taiwan lies on the western edge of the Pacific “rim of fire,” and continuous tectonic movements have created majestic peaks, rolling hills and plains, basins, coastlines, and other natural wonders. Taiwan experiences climates of many types: tropical, sub-tropical, and temperate, providing clear differentiation between the different seasons. There are about 18,400 species of wildlife on the island, with more than 20 percent belonging to rare or endangered species; among these are the land-locked salmon, Taiwan mountain goat, Formosan rock monkey, Formosan black bear, blue magpie, Mikado pheasant, Hsuehshan grass lizard, and many more. The government has established 6 national parks and 11 national scenic areas to preserve Taiwan’s best natural ecological environment and cultural sites. The railroad system provides excellent access to these treasures. The history of railroads in Taiwan dates back to 1887, in the declining years of the Qing Dynasty, when court official Liu Ming-chuan started work on a section of track in the northern part of the island. The Japanese expanded on that beginning when they occupied Taiwan from 1895 to 1945, and the round-the-island network was completed after the island was restored to Chinese rule. Today, more than a century after its small beginning, Taiwan’s convenient railway network consists of the West Coast Trunk Railway, East Coast Trunk Railway, North-Link Railway, and South-Link Railway. Passenger service is divided into four classes, offering travelers a choice depending on their destination, the urgency of their trip, and the size of their pocketbooks. The scenery along the railroad glides by in a never-ending sequence of change, and each line has its own unique characteristics. The long, narrow, mountainous nature of the island’s terrain lines the length of the railways with exquisite scenes of mountains and rivers, and the rail passenger gains access to scenes that are out of reach of the highway. Taiwan’s railroads are far more than just a tool of transportation; they embody a deep affinity with the development of local culture and society, and have left behind large numbers of historic relics, including old stations and track sections that hark back to the past and reveal unique facets of local history. West Coast Trunk Line System: This includes the Keelung to Kaohsiung north-south line, the Taichung Line (Zhunan to Changhua), Pingtung Line (Kaohsiung to Fangliao), and South-Link Railway (Fangliao to Taitung New Station). (1) Main Line, Taichung Line, Pingtung Line: The main cities served by this system include, north to south, Keelung, Taipei, Taoyuan, Hsinchu, Miaoli, Taichung, Changhua, Yunlin, Chiayi, Tainan, Kaohsiung, and Pingtung. Each of these cities has its own local customs and natural scenery, and itineraries through them are quite diverse. Travelers can arrange tours of the Taipei, Taichung, and Kaohsiung metropolitan areas, savor the famous delicacies of Miaokou (Temple Mouth) in Keelung, see the fascinating City God Temple in Hsinchu, taste the snacks of Danshui and the seafood of Pingtung, enjoy the pottery of Yingge and the wood-carving culture of Sanyi, and observe the historic sites of Sanxia and Tainan. They can also choose a tour through the countryside of Chiayi, or go bird-watching at the estuary of the Keya River in Hsinchu or the Zengwen River in Tainan. (2) South-Link Railway: This is the only railway line in Taiwan that gives you access to both the Taiwan Straits and the Pacific Ocean. Passing through the southernmost extremity of the Central Mountain Range, it links Pingtung in the west with Taitung in the east, along the way allowing passengers to enjoy views of the beautiful Pacific, the awesome natural sights of the mountains, and the lovely mountain-and-sea views as well as the aboriginal cultures of southeastern Taiwan. Among the most famous sights of this route are the daylily fields of Taimali, the hot springs of Zhiben, the Bamboo-Pole Festival of the Atayals, and the vast expanses of the Pacific. East Coast Trunk Line System: This system encompasses the Yilan Line which reaches from Badu to Suao, the North-Link Railway which runs from Suao to Hualien, and the Hualien-Taitung Line, which together form a complete system that serves all of eastern Taiwan and displays the attractions of Yilan, Hualien, and Taitung. Trains run along the seacoast, with the high mountains on one side and the vast ocean on the other providing the most intoxicating scenery on this part of the round-the-island railway. Travel these lines and you will experience the permutations and changes of natural beauty; after passing though the flat vastness of the Lanyang Plain, and enjoying the bucolic flatlands and the distant sight of Turtle Island along the way, you will pass through Suao and the scenery outside your window will undergo a drastic change as majestic sights of mountain and sea appear before your eyes. Tourist sites along the way include the Northeast Coast National Scenic Area, the Lanyang Plain, Turtle Island, the East Coast National Scenic Area, the East Rift Valley National Scenic Area, Taroko National Park, and Taroko Gorge with its Swallows’ Grottos, Tunnel of Nine Turns, Bulowan, Cuilu Precipice, Tianxiang, and the Liwu River. Besides enjoying the stupendous masterworks of nature’s art, travelers here can also arrange itineraries that allow them to experience aborigine culture, bird watching, hot springs, rustic old towns, and other special sites of the area. In addition, there are also slow trains that run along narrow-gauge railways: the Alishan Forest Line, Jiji Line, Pingxi Line, and Neiwan Line. For those who have just come to Taiwan, riding on this kind of tourist train that proceeds at a leisurely pace and allows passengers to enjoy the scenery along the way to the utmost can provide a new and interesting experience. Pingxi Line: This line runs through Pingxi Township in Taipei County, and can be boarded at the Ruifang Station or Houdong Station on the main railway line. Travelers in this branch line can savor the beauties of mountain cliffs, streams, and waterfalls along the way, and experience the rustic lifestyle of country villages and small mining towns. The main scenic spots along the line are the Shifen Waterfall, Wildman Valley Waterfalls, and Lingjiao Waterfall. Neiwan Line: This line is located in the easternmost part of Hengshan Township in Hsinchu County. You can board trains on this branch line at the Hsinchu Railway Station; as your train moves slowly along the track, passengers can gain a feeling of the rustic life in mountain towns. The main scenic spots along the line include the Beipu Scenic Area and the Wuzhishan (Five-Fingers Mountain) Scenic Area. Jiji Line: This line passes through bucolic scenery in Changhua and Nantou countries, giving access to “green tunnels,” historic sites, rivers, old pottery kilns, and the little town of Jiji. A ride along the Jiji Line is like a trip into the past. 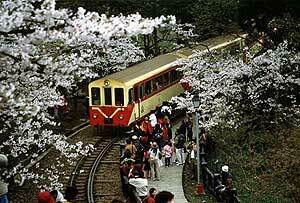 Alishan Forest Line:This is one of only three alpine railways that are left in the world. It carries passengers through four climatic zones—tropical, subtropical, temperate, and frigid—and each section of the line passes by truly unique scenery. It also allows you to experience a “corkscrew” ride as it winds its way up one of the mountains along its line; it ends up at the Alishan National Scenic Area, where you can see the spectacular sunrise, sea of clouds, sacred tree, flower season, and mountain pathways. If you want to travel the complete length of Taiwan’s railway system, you can purchase round-the-island tickets from the Taiwan Railway Administration. These seven separate tickets allow you to stop at seven stations along the way, as long as you get back on at the same stations. The tickets are valid for 15 days from the date of your first ride. If you don’t want to bother making your own arrangements, you can take a special Tourist Train. Tickets on these trains are currently sold as part of a package that includes accommodation and tours; in addition to bigger and more comfortable seats, these trains are also equipped with salon and dining cars where passengers can engage in karaoke singing and savor hot meals. The railroad will always have an allure for travelers that other methods of transportation cannot match. Do you want to take a romantic journey by rail? Take a trip on the Taiwan railways, and you will not be disappointed!